Ever wondered how bloggers actually make money? Growing up, I never wanted to be a ‘blogger’ or didn’t even know that you could run blogs and niche websites as a part-time or full-time job. I certainly wasn’t thinking about how to monetize a blog. Times have definitely changed, and I’m happy to see bloggers earning an impressive amount of money off their blogs. In my opinion, having your own website or blog is one of the best ways to make money online but it doesn’t happen overnight. Ideally, before you can monetize a blog, you need to have plenty of traffic coming to it, which can take time to build. Your website must be self-hosted, so that means it can’t be set up through Blogger or WordPress.com. This can be more expensive upfront, but you’ll need your own domain name to start monetizing your blog. Think of it like owning a house. You have a better chance of making money with a house you own than a home you rent because there will be more limitations. If you’re interested in setting up a self-hosted blog, but aren’t technically savvy, you can still get it done relatively simply through a hosting company like Bluehost. They will set you up with a domain name and get your site up within minutes. Bluehost charges $2.95 per month to host your website, when you sign up through our link. Next, you need to start creating content that is useful and engaging. Create an ideal reader profile to narrow down which type of person your blog would be best for. Carefully choose some topic categories for your blog and focus on filling a need and helping people solve a problem. Even if that ‘problem’ is just providing entertainment, make sure your content is high-quality. If you want readers to take time out of their day to visit your blog, you need to give them a reason to come back. Finally, you’ll need to focus on growing your traffic, which you can do by improving your site’s SEO, using social media to market your blog, writing guest posts for other sites, and so on. Once you’ve completed these three steps, you can move on to monetizing your blog if you feel comfortable. If you want additional steps on how to set up your blog, check out our guide on how to start a blog for step-by-step directions. There are several ways to make money with a blog and I’ll detail each of them below. Placing ads on your blog is one of the easiest ways to monetize it. There are two types of ads you can choose from and those include CPC or CPM ads. CPC stands for cost-per-click (also known as pay-per-click) and those are ads you’ll place throughout your site in the sidebar area, as a banner, etc. With CPC ads, you only get paid if someone clicks on the actual ad. CPM stands for cost-per-impression. I like these types of ads because they are an easy way to monetize your blog. For example, with CPM ads, you may get paid a fixed dollar amount based on 1,000 impressions (or 1,000 people viewing the ads on your site). No clicks are necessary. There are several CPM ad networks you can choose from, but one of the most popular ones is Google Adsense. Google Adsense chooses ads that are relevant to your viewers, which may prompt them to click on them. You must reach a threshold of $100 minimum in ad revenue in order to receive a payment from Google Adsense. Another less common way to make money from ads is with private advertising. A company may approach you and offer to pay you a monthly fee to place ads on your site. Making money from advertising is fairly passive, but some people don’t like the idea of putting ads on their site, which is fine because there are other ways to monetize your blog. Working with brands is another way to monetize a blog or niche website. Some brands may want to sponsor content on your website or ask you to write about a particular topic. Other times, you may be sent a product sample to review or giveaway on your site. Brands might also want to sponsor social media posts if you have a large social media following for your blog. When working with brands for sponsored content, it’s important to disclose the relationship on your blog or social media so your readers know you are working with a sponsor. Also, when reviewing products and services, be completely honest about your opinions and experience. You can cold pitch sponsors you’d like to work with or you can sign up for an influencer network like Izea or the Clever Collective. Affiliate marketing is another popular way to monetize a website. Have you ever used a great product or service and felt you just had to tell a friend about it? Affiliate marketing works with that foundation in mind, only you can actually earn money from referring others to try out certain products and services. Affiliate marketing allows you to earn money by placing an affiliate link on your website, social media account, etc. so people can purchase a product or service you recommend. The link is unique to you so you can track clicks and conversions, but each affiliate program is a little different so you’ll need to carefully read through the terms of each program you sign up for. Amazon Associates is a common affiliate program to use if you recommend books and other products from Amazon on your blog. When it comes to choosing the right affiliate programs, stick to products and services that you’ve tried yourself and truly believe in. If you are just trying to promote crappy products in order to make a quick buck, your readers will see that and get turned off from your site. If you’re looking for more guidance before you jump in to affiliate marketing, consider taking Making Sense of Affiliate Marketing. In this online course, my friend Michelle shows you how she makes over $50,000 per month from affiliate marketing and shares the tools you need to grow your affiliate income. If you want to start earning money from your blog fast, you can offer a service. This was one of the first things I did to monetize my blog and I offered a freelance writing service while using my blog posts as a writing portfolio. If you have any special skills or talents, be sure to set up a page on your website to offer details of your service offerings so people can contact you. If you’re looking to work from home as a virtual assistant, editor, consultant, coach, etc. it would be a good idea to advertise these services on your website. Digital products are all the craze right now. Many people are creating courses, printable downloads and ebooks to sell on their websites. Creating products can be a great semi-passive income stream but it requires a lot of work upfront and some ongoing maintenance. Nevertheless, selling your own products can really boost your brand and diversify your income. Finally, you can monetize a blog can by offering a paid membership program to your readers. If you create an exclusive program or support system to help them solve a pressing issue, you’re bound to find some readers who are willing to pay for that monthly membership. If you run a local site, you can host paid events throughout the year. I know some bloggers who run online master classes for which they charge a small fee. Given all the unique ways you can monetize a website, it makes perfect sense why there are so many six-figure bloggers out there, or those who have been able to quit their job thanks to running a blog. When you turn on the TV, you watch ads and understand that the network needs to run commercials to fund the content you’re enjoying free of charge. You might go to an event hosted by a nonprofit and see that they have a sponsor. Do you then view that business as ‘selling out’ or being money hungry? 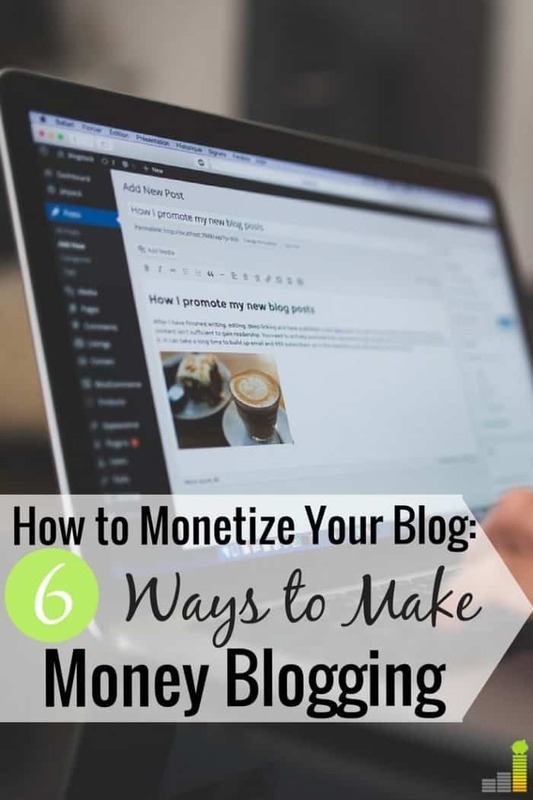 While blogging is a newer profession, it’s still hard work and as long as you keep your readers’ needs and interests at heart, you can definitely monetize your blog without feeling like a sleazy marketer. What are some other ways you’ve seen someone monetize a blog? Do you thinking blogging is a sustainable income source for the long-term? What’s your favorite way to make money online? The post 6 Ways to Monetize a Blog (The Ultimate Way to Earn Money Online) appeared first on Frugal Rules.